PFF’s Nathan Jahnke has taken a deep dive into the numbers to find an interesting piece of information about all 32 teams after 12 weeks of football. If you would like to make some observations of your own, you can do so with PFF Elite, where you can find several signature statistics for every offensive and defensive position in football, thanks to Premium Stats 2.0. 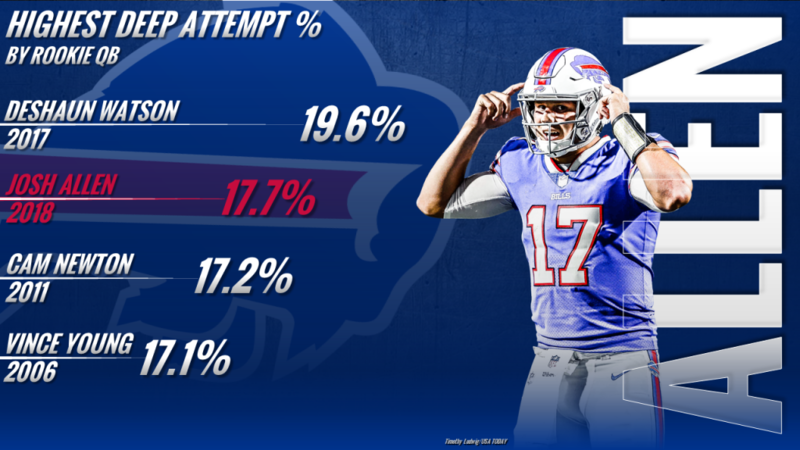 Buffalo Bills: Rookie quarterback Josh Allen has thrown deep on 17.7% of his pass attempts, which is second-most for a quarterback in his rookie year in the past 13 years just behind Deshaun Watson. Miami Dolphins: Over the last 13 seasons, Frank Gore has 1152 runs of five or more yards. That is 190 more than any other back in that time. New England Patriots: Since Week 7, Marcus Cannon hasn’t allowed a sack or hit and has allowed just two pressures. His 1.82% pressure rate allowed is the lowest among right tackles in that time. New York Jets: While Avery Williamson had a slow start to the season, he’s produced 25 run stops since Week 3, which is the most for all linebackers in that time. Baltimore Ravens: Since Week 7, Gus Edwards has averaged 0.29 missed tackles per carry, which is the best rate among backs. Cincinnati Bengals: Over the last two seasons combined, William Jackson III has allowed a 46.8% catch rate which is lowest among all cornerbacks. 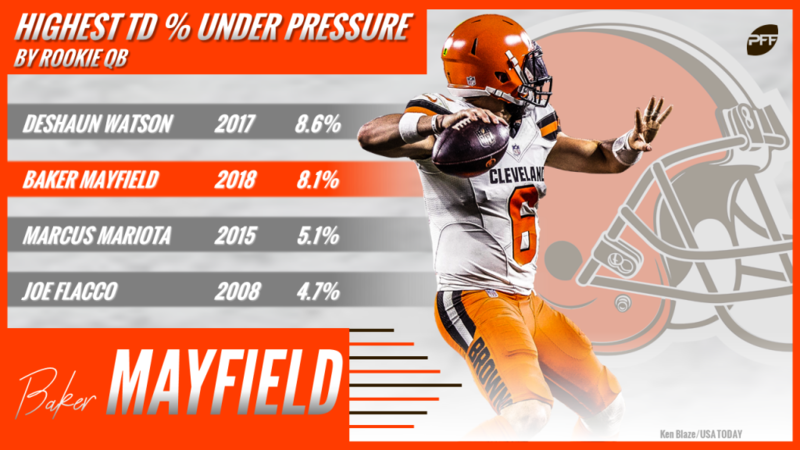 Cleveland Browns: When Baker Mayfield is under pressure, he is still throwing a touchdown on 8.1% of his pass attempts. That is the second-best rate for a rookie in the past 13 years. Pittsburgh Steelers: Before the Steelers’ bye week, Ramon Foster was averaging 2.5 pressures allowed per game. Since the bye week, that’s down to 0.6 pressures per game, as he’s not allowed more than one pressure in a game in that span. Houston Texans: The Texans’ defense has 116 stops in coverage this season, which is tied for the most among all teams. Indianapolis Colts: The Colts have 51 pressures this season coming from their rookies, which is the most for any team. Kemoko Turay leads the team with 33, while Darius Leonard, Tyquan Lewis, Matthew Adams and Skai Moore have all contributed. Jacksonville Jaguars: Over the last two years, A.J. Bouye has allowed 2.43 yards after the catch per reception, which is the lowest rate for all cornerbacks. 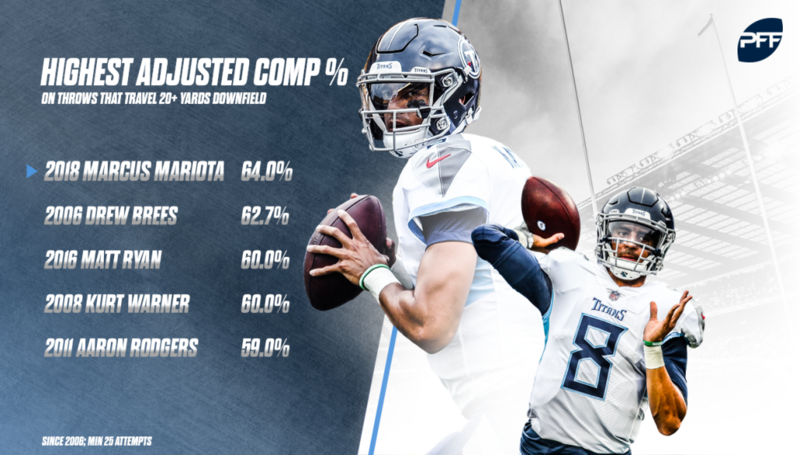 Tennessee Titans: Marcus Mariota has only attempted 25 deep passes this season, but he has completed 11 of them and has had five of them dropped. This gives him an adjusted completion percentage of 64% on deep passes, which is the best rate for any quarterback with 25 or more deep attempts in the past 13 seasons. Denver Broncos: The Broncos have eight different players with 200 or more run-defense snaps and a run-stop percentage of 7.5% or better. That is more than any other team. The average team has 3.6 players with these qualifications. Kansas City Chiefs: Defensive tackle Chris Jones has had seven pressures in each of his last two games. He is just the 14th interior defensive lineman in the last 13 years to have back to back games with seven or more pressures in each. Los Angeles Chargers: Over the last two seasons combined, Keenan Allen has averaged 2.54 yards per route run, which is tied for third-most among all wide receivers. Oakland Raiders: Jared Cook has 125 yards after the catch on third downs, which is the most for all tight ends. 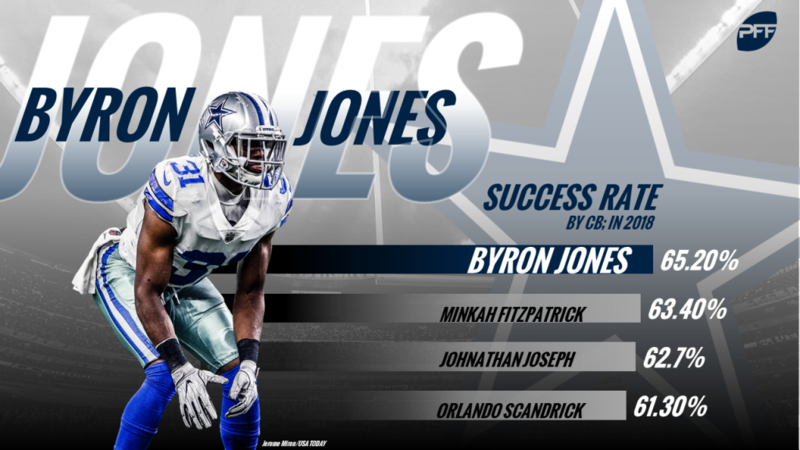 Dallas Cowboys: Byron Jones has allowed a 50% catch rate, and on seven of his 23 catches allowed, he’s made a tackle for a stop. That 65.2% success rate is the best rate for all cornerbacks this year. New York Giants: Aldrick Rosas has made 22 consecutive field goals within 50 yards, including all 20 this season. That is the longest active streak for kickers. Philadelphia Eagles: Carson Wentz has an adjusted completion percentage of 82.3% when he’s not under pressure. That is the fifth-best rate for a quarterback this year and second-best for a quarterback in his third year over the last 13 seasons. Washington: While Jonathan Allen is known for his pass rushing, he has 14 run stops since Week 7, which is the second-most for all interior defenders. Chicago Bears: James Daniels and C Cody Whitehair have gone 80 and 81 consecutive pass blocks, respectively, without allowing a pressure. Those are the longest active streaks for left guards and centers. Detroit Lions: Nevin Lawson has allowed 75 or fewer yards in 45 consecutive games dating back to 2015. That is the longest active streak, more than doubling any other cornerback, and is tied with Darrelle Revis from 2007-2010 and Patrick Peterson from 2014-2017 for the longest streaks for a cornerback in the last 13 seasons. A cornerback needed at least 10 coverage snaps in each game to qualify. Green Bay Packers: The Packers have made a first down or touchdown on 30% of their rushing attempts, which is the highest rate for any offense this season and the second-best rate this decade. Minnesota Vikings: Since Dalvin Cook returned to action in Week 9, he’s forced seven missed tackles as a receiver. That is the most for running backs since Week 9. Atlanta Falcons: Calvin Ridley has eight receiving touchdowns this year, which is more than any rookie this year as well as more than any rookie had last year. Carolina Panthers: Christian McCaffrey has gone 79 straight catches without a drop going back to last season. That is the longest active streak for running backs and eighth-longest streak in the past 13 years. New Orleans Saints: Drew Brees has an adjusted completion percentage of 70.6% on passes that are in the air for 10 yards or more. He is the only quarterback in the past 13 years to be that accurate on intermediate and deep passes. Tampa Bay Buccaneers: Since Lavonte David was drafted in 2012, he’s had 412 stops, which is second-most for all defensive players. Arizona Cardinals: Opposing quarterbacks have had an average depth of target of 7.0 against the Cardinals, which is tied for the lowest among defenses. Los Angeles Rams: Over the last two seasons combined, Aqib Talib has allowed 0.56 yards per coverage snap, which is the lowest rate for all cornerbacks. San Francisco 49ers: Matt Breida has run for 15 or more yards on 11% of his carries. The only back with over 100 carries in the past 13 years with a higher rate was Adrian Peterson in 2012 at 11.1%. Seattle Seahawks: Over the last two years, 17 wide receivers have 20 or more catches and one or fewer drops. Four of them are the Seahawks current top four wide receivers: Doug Baldwin, Tyler Lockett, David Moore and Jaron Brown.